I checked the Search Function, found 0 info......Surely some of you guys have used these. What's the poop ? GOOD, BAD ? I've read mixed reviews. I almost bought a tuck, just out of curiosity. Try em and let us know. The BIC Chrome Platinum don't work well for me. OK....I'll bite the bullet and do the "test"...…. Very sharp blades. According to the objective testing at Refinedshave dot com sharper than Feather after one use . I like them. This works great for me. Sharp and smooth enough for my face and I get 10 shaves per blade. Can't quite bring myself to try a blade with the name BiC. (11-25-2018, 10:07 PM)Niemander Wrote: Can't quite bring myself to try a blade with the name BiC. pen maker in the world. Given that, they might be worth the try. Lemme know what you find out. Used one this morning. IT IS THE WORST BLADE I HAVE USED IN MY 50+ YEARS OF SHAVING!!!!!!! I used the RAW RS-10 with SV/Asylum COLONIA soap, I could only do 4 strokes with this HORRIBLE BLADE! I did not know they made a serrated razor blade. A tin can lid is smoother and sharper than this blade. The BIC is one of my favorite blades. It's really sharp. 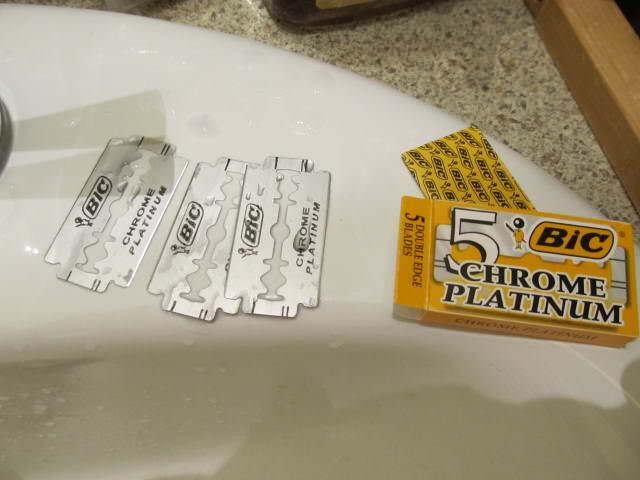 That being said, I have to toss more BIC blades as bad out of the gate than any other blade I've used (by a lot). A move to Chinese production would no doubt help quality control. I only pay $8-10/100 (in SE Asia) so I don't mind. Given the staggering difference in how people view this blade, is it possible that there are multiple production lines making them? (11-28-2018, 10:51 AM)WegianWarrior Wrote: Given the staggering difference in how people view this blade, is it possible that there are multiple production lines making them? Good question....Or country ? These are made in Greece . I just have NEVER felt such a BAD blade. Maybe I should have tried "corking"
can't now I threw that blade away ! I'm trying another tomorrow …. Today I used the RAW RS-10 and SV 70th Anniversary soap. First stroke, #@&!! Second stroke, you &**^%$#@ kidding me!! I put in another blade, What in the #%**. Four blades..In two days. All horrible. I think they sharpen them on a sidewalk. I have one more blade in the tuck, I'm not even going to try again. Entirely possible the whole tuck is defective. Has happened to me ...well I stopped at two when it happened, I thought two in a row was sufficient clue something was off. Obviously lots of like/love this blade, me among them. I suppose it's possible for you too just don't get along but it's hard to understand why that would be. As stated, it's really sharp, sharper than Feather on second use, which some can't handle, though that doesn't seem to be your issue ...I dunno .. Sorry about your experience. But I'm thankful for the review. Good public service info; & still chuckling over the sharpened on sidewalk comment. Lesson learned I guess: pens =/= razor blades. Let's hope Calvin Klein sticks to men's underwear. It's not you...blade from the tuck you sent was definitely nasty. 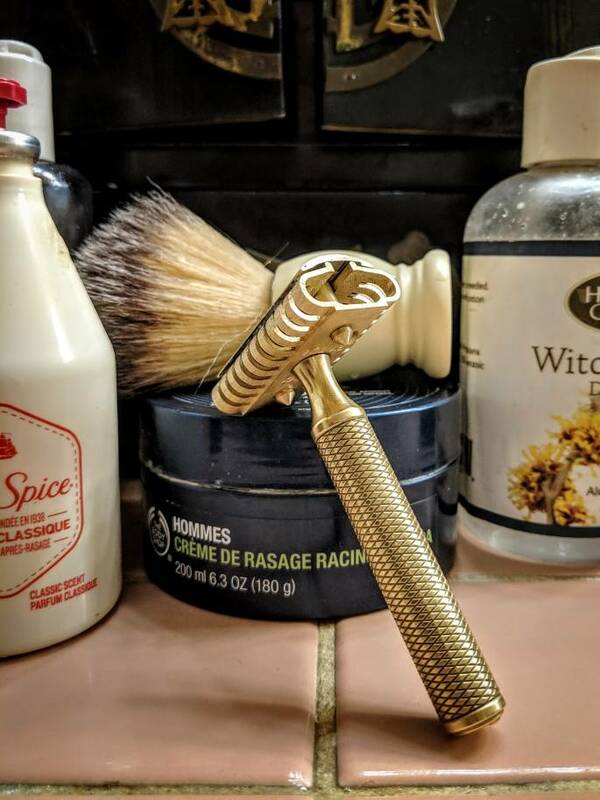 I substituted a BIC from my stash and it was ok. Razor is Tom White's custom copy of the 30s French Famex.